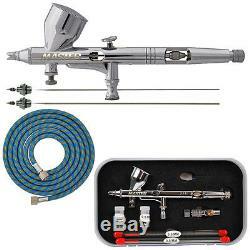 High Precision Detail Control Dual-Action Gravity Feed Airbrush Professional Set. (Provides Extreme Atomization and Air Control). Includes Free 6' Braided Air Hose with 1/8 Ends. The G444 Airbrush Pro Set Includes. Model G44 Master Airbrush with 0.2, 0.3. And 0.5mm Needles & Nozzles. Use the 0.2 or 0.3mm set-ups for. Applications where accurate spray control is. Required to do highly detailed work such as. Automotive and Motorcycle Graphics, Fine. Art, Nail Art, Illustration & More! Use the 0.5mm set-up when you desire a. Wider spray pattern or when thicker materials. Dual Purpose Airbrush Quick Disconnect. With Air Flow Control Valve. How to Airbrush Training Book to Get You. Started, Published Exclusively By Master. The fully loaded Model G44 Airbrush includes features that save you time and increase your productivity. Precision Machined 4 piece matched airbrush. Head system for extremely fine atomization. Direct Air Control Regulation Valve at the. Head of the airbrush enables accurate micro. Cutaway Handle that allows quick cleanning. Fluid Control Knob that provides easy. Trigger adjustment and control of paint flow. Most Usage Applications and Paint Spray Media. High Production Spray Environments due to the Airbrushes Balance & Comfortable Feel. Internal Mix Fully Atomized Spray Pattern. Funnel Shaped Gravity Feed Cup. 0.2, 0.3 and 0.5mm Needles/Nozzles with a. 4 Part Precision Matched Head System. Spray Pattern: Hairline to 2 Wide. Made with High Quality Precision Components that enable this airbrush to work. Efficiently while providing exceptional atomization and accurate spray control. The Precision Machined 4 Piece Matched Airbrush Head System provides fine. Atomization for extra control and increased detail. The Crown Cap prevents paint build up at the nozzle. Removing the Crown Cap and. Nozzle Cap enables you to spray the full range of texture and stippling effects. Provides superior control of airflow at the head of the airbrush through the Direct. A quick turn of the valve can instantly take you from. Full atomization to extra fine detail. Fully opening the Valve makes it very easy to. Funnel shaped gravity fluid cup allows you to use as little as drops of fluid. Excellent for High Production Spray Environments due to it's Comfortable Feel. And Cutaway Handle that allows you to quickly flush and clean passageways by. Grabing the needle chucking nut. Fluid Control Knob for easy adjustment and control of paint flow. The Solvent Resistant PTFE Needle Packing prolongs the airbrushes life; enables. You to use of Solvent Based Automotive Paints: Urethanes, Lacquers and Enamel s. All Parts Stocked for this Airbrush. MASTER AIRBRUSHES, AIRBRUSH SYSTEMS, PARTS & ACCESSORIES, PAINTS, and MORE. MASTER Airbrushes and AirBrushDepot Ccompressor Systems. Airbrush Learning Center - DVD's and Books. We are an authorized dealer for all the product lines we sell. If a listing is for a particular item then that is what you will receive. In some cases we may not need to file carrier claim. Paint Products and DVD's are excluded from this guarantee. Defective claims can only be made up to 30 days after receipt of your order. Then send your item back to us with a copy of the original order. SPECIFIC ITEM EXCEPTIONS: PAINT & DVD's - If defective or damaged they will only be replaced. We must have picture documentation of damage emailed to us on all paint related items in order to authorize a replacement order or return authorization. This listing is currently undergoing maintenance, we apologise for any inconvenience caused. Get your own map of past buyers. 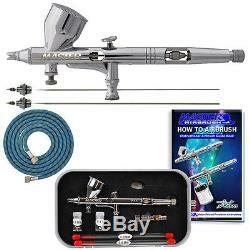 The item "New MASTER PRO Dual-Action Gravity Feed AIRBRUSH KIT SET with 3 TIPS Fine Detail" is in sale since Tuesday, November 06, 2012. This item is in the category "Crafts\Art Supplies\Airbrushing".